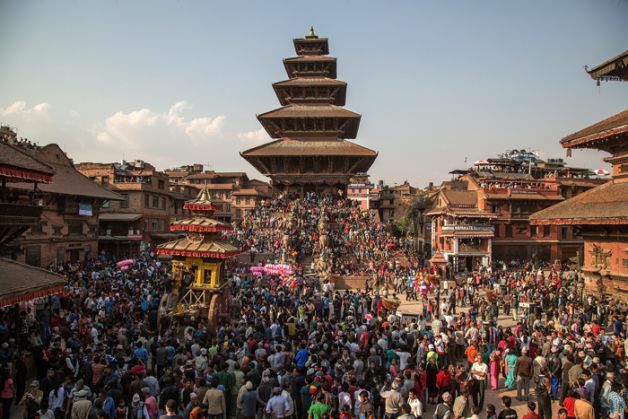 If secularism means protecting Sanatana Dharma, is Nepal's new constitution a mere charade? On 14 September 2015, the Constituent Assembly of in Kathmandu retained the provision of the Interim Constitution that Nepal shall remain a secular state. However, the new constitution adds that secularism shall mean the protection of Sanatana Dharma and religious and cultural freedom. Nepal was once the only Hindu kingdom in the world, but now it is one of the youngest federal, democratic republics. The supreme law of the land decrees that "secularism" shall no longer stand for matters that are not related to religious, sacred, or spiritual affairs. On the contrary, it will specifically obligate the state to protect Sanatana Dharma. This seems to be a declaration of a Hindu State by stealth. After all, the term Hindu is merely a Western invention for the group of faiths that were once collectively known as Sanatana Dharma. Politics over the statute's language had begun during the elections to the second constituent assembly in November 2013. Nepal has a mixed electoral system. Voters vote not just for the candidate from their constituency but also for a party. Each party then nominates representatives to the legislature in proportion to the votes obtained. The monarchist Rashtriya Prajatantra Party-Nepal was the only party in the fray that advocated a Hindu Rashtra. Unsure of its chances, the party came up with a dual approach that urged voters to vote for the candidate of their choice in direct category but cast the party vote in its favour. As a result, it emerged as the fourth largest party in the legislature on the basis of proportional representation even though it failed to get a single candidate elected directly. The RPP-Nepal continues to insist that the status of Hindu state be restored in the new statute. Nepali Congress is the oldest and largest party in the constituent assembly and it currently heads the government with Sushil Koirala as Prime Minister. It had advocated for constitutional monarchy for so long in the past that a sizable section of its supporters continue to be closet monarchists, reluctant republicans and openly religious. A powerful politician of Nepali Congress Khum Bahadur Khadka has been consistently campaigning for a Hindu Rashtra with the help of a few Swamis and Yogis. This was before he was convicted for corruption. Scion of the Koirala clan and an up-and-coming politico, Shekhar Koirala recognised that the Hindutva constituency within his own Nepali Congress party was quite strong. He introduced an independent member's amendment bill that Nepal be re-declared a Hindu state. He must have been given some assurances for him to withdraw his proposal at the last moment. Hindu priests and the Brahmin petty bourgeoisie form the main support base of Communist Party of Nepal (United Marxist Leninist), despite its name. Leaders of this party openly admit Hindutva proclivities and profess to be protectors of Nepali culture, which unambiguously implies a Hindu way of life. The UML wanted to do away with the secularism declaration and not mention anything about religion in the Constitution. The silence would have automatically meant the negation of secularism and retention of Sanatana Dharma traditions. Once a revolutionary party, the United Communist Party of Nepal-Maoist is a pale shadow of its former self. It has no position on any issue of national importance except a vague commitment that a statute be promulgated at all costs. The drafters of the Constitution-all of who happen to be Brahmin men - perhaps realised that the retention of secularism will alienate a very strong and vocal constituency of Hindu castes while its elimination may end up antagonising indigenous Janjatis of the hills and Muslims of the southern plains. They decided to redefine the term itself to get over the quandary. The Madheshbadi parties, with significant Muslim and Janjati constituencies, may have urged restraint in their own self-interest but they have boycotted the ritualistic process of writing a constitution. They allege that the concerns of marginalised sections of the population have been ignored. The redefinition of terms in the new Constitution isn't restricted to secularism. According to the provisions that have been adopted, gender equality has come to mean lesser citizenship rights for women. Nationality and citizenship have become synonymous. This strengthens community rights of sections which already enjoy a monopoly over all organs of the state. Militant Hindus bombed four churches in the eastern part of Nepal soon after the adoption of the secularism clause. It is quite likely that laws proscribing proselytisation shall be retained in the name of protecting Sanatana Dharma. Madheshis have been campaigning for inclusion and meaningful federalism for over one month now. Over three dozen protestors have died in one of the most brutal crackdowns in the history of the Nepal Police. The Nepal Army patrols the street, ostensibly to assist the local administration, but with the effect of terrorising Madheshis. The high-caste Hindus rush through the charade of writing a constitution regardless. After secularism, inclusion, citizenship and federalism, it may now be the turn of democracy and republicanism to be redefined to suit the convenience of the Permanent Establishment of Nepal (PEON). It's hardly surprising that people are dying. According to Confucius "Where words lose their meaning, people lose their lives." The death count in the southern plains show that words are losing their meaning in Nepal rather fast. TWEET THIS Militant Hindus bombed 4 churches in eastern Nepal soon after it decided to remain a secular state If secularism means protecting Sanatana Dharma, is Nepal's new constitution a mere charade?